At an organic farm just outside Monterey, Calif., a super-eco building material is growing in dozens of darkened shipping containers. The farm is named Far West Fungi, and its rusting containers are full of all sorts of mushrooms–shiitake, reishi and pom-pom, to name a few. 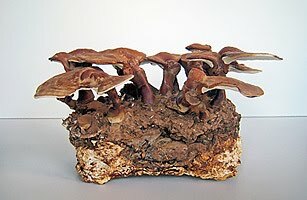 But Philip Ross, an artist, an inventor and a seriously obsessed amateur mycologist, isn’t interested in the fancy caps we like to eat. What he’s after are the fungi’s thin, white rootlike fibers. Underground, they form a vast network called a mycelium. Far West Fungi’s dirt-free hothouses pack in each mycelium so densely that it forms a mass of bright white spongy matter. Mycelium doesn’t taste very good, but once it’s dried, it has some remarkable properties. It’s nontoxic, fireproof and mold- and water-resistant, and it traps more heat than fiberglass insulation. It’s also stronger, pound for pound, than concrete. In December, Ross completed what is believed to be the first structure made entirely of mushroom. (Sorry, the homes in the fictional Smurf village don’t count.) The 500 bricks he grew at Far West Fungi were so sturdy that he destroyed many a metal file and saw blade in shaping the ‘shrooms into an archway 6 ft. (1.8 m) high and 6 ft. wide. Dubbed Mycotectural Alpha, it is currently on display at a gallery in Germany. After the husks are cooked, sprayed with water and myco-vitamins and seeded with mushroom spores, the mixture is poured into a mold of the desired shape and left to grow in a dark warehouse. A week or two later, the finished product is popped out and the material rendered biologically inert. The company’s first product, a green alternative to Styrofoam, is taking on the packaging industry. Called Ecocradle, it is set to be shipped around a yet-to-be-disclosed consumer item this spring.